New head coach Dan McFarland will seek out the clues of what he believes is a successful legacy at Ulster Rugby and build on that to make the Province competitive again. Just into his second week officially in the role, McFarland has been “learning quickly” but he was in a hugely positive mood yesterday ahead of the new Guinness PRO14 campaign kicking off this weekend. Ulster face the 2017 champions and last season’s beaten finalists Scarlets in their first game of the season at Kingspan Stadium on Saturday. McFarland admitted that was a huge test first up but one the squad were keen to face. And he was also as keen to see where Ulster were at following two pre-season defeats to English Premiership opposition over the past fortnight. “It will be a barometer of where we are and it is the first chance for me as a new head coach to really find out about the guys,” said McFarland. Ulster have just finished a difficult season and in previous years they have failed to enjoy success in terms of silverware, in spite of coming close on occasions. When Ulster appointed McFarland as the new man at the helm, the club said he was the number one choice - but will be live up to that expectation? In terms of turning it around, McFarland said: “Looking in from the outside, I see a successful legacy. “So what is the first thing I do? I look for clues what is it that brought the success in the first place, where are they? Draw those out and keep them. 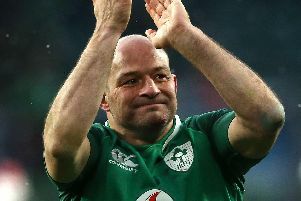 “I remember when I came up here to play (with Connacht) was the competitive spirit - that fight for every inch mentality that you came upon on the pitch. “Nothing was given for free. When I look at the players now that’s the first thing I’m looking for. “Before the detail and everything else we have to lay down that marker and show that kind of spirit and giving them the mechanisms to do that. “It’s not just question of asking for it. It’s providing them with the opportunities to do it, to be competitive,” added McFarland.